You must make bookings at least 5 minutes in advance of the time at Steak & Lobster Marble Arch. 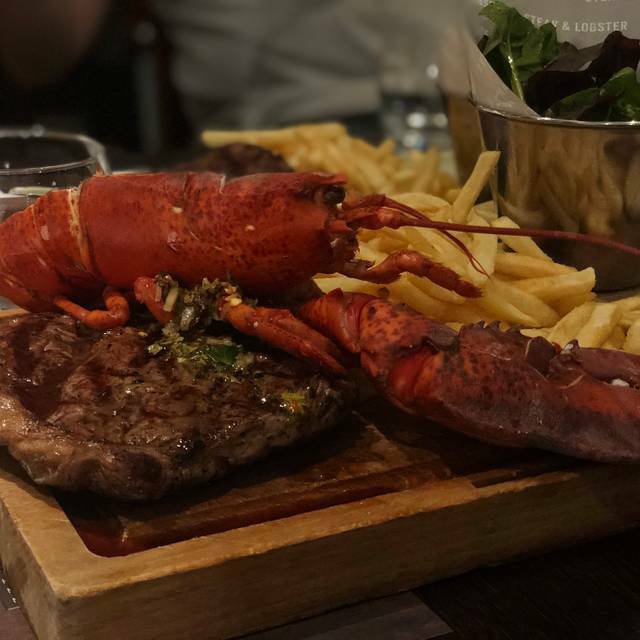 At Steak & Lobster, we aspire to be the very best in what we do; delivering the finest steak and freshest lobster to your plate. We believe simplicity is key and let the food speak for itself. With freshly caught lobster, and steak from County Antrim in Northern Ireland, we understand the importance of provenance and quality. Andrea was very attentive, thank you. Food and ambience were excellent. Great food, quick service and very accomodating service crew. Good for family with teen age children! 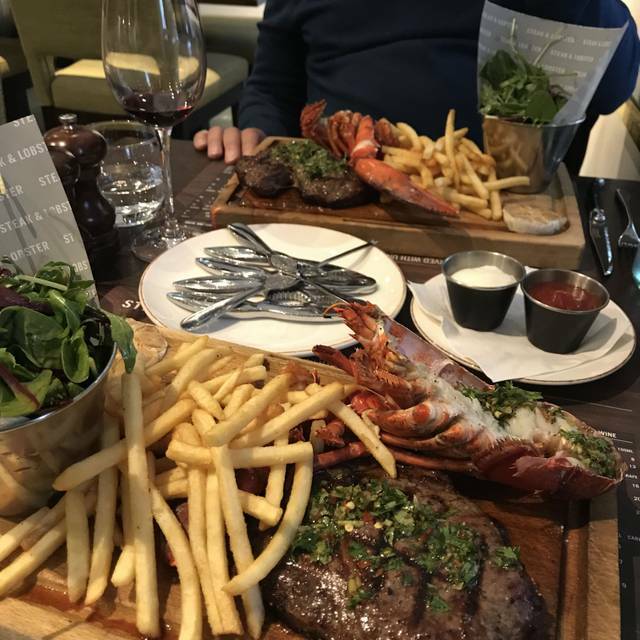 From Agnelo's warm welcome, the evening to celebrate my wife's birthday was everything we hoped - I had the Surf and Turf upgrade to include fillet steak, - beautiful!. My wife had Lobster with Agnelo's kind assistance in cracking the claws. We shared the dessert, and then that little extra birthday touch topped the evening. Thanks guys, I am sure we will be back! Good food, good portion size and tasty. Cocktails tasted good too. Noise level was good not too loud. Had a very friendly waiter topping up our drinks. The steaks were cooked well, fries hot and fresh. Lobster a little disappointing. Not alot of lobster meat. Have had previous good experiences. However, on this occassion, one of the steaks had to be sent back to the kitchen as it was not cooked as requested. The other steak was cooked fine, but had very little seasoning and was not particularly enjoyable. Chips were tasteless, which was also disappointing. Very attentive service. Lobster was tasty and a good value. We did not take advantage of the unlimited chips and salad because the initial portions were generous, but would make the meal an even better value for a big eater! Good value, well hidden restaurant! Simple food with attentive service. Excellent food. Great service. Came across restaurant and thought we would try. We will be back. The place is very easy, food is good and the service is very kind, if you’re looking for surf and turf is a good option! Although my wife enjoyed her surf and turf, my 2lb lobster was not good at all. I asked for grilled and when breaking the claws, they were full of cold water and there was not much meat. I would say that it had been cooked earlier and left in the fridge before it was put on the grill to warm up. I have eaten lobster on many occassions and this was by far the worst i have had. Even the lemon butter sauce that cost an extra £2 was cold. I did not say anything as i did not want to spoil my wifes dinner. Sorry will not return as far better places to eat lobster in London. We visited Steak one of the best steaks we've had. The service was great; our waiter Bijo was friendly and helpful. We will definitely return. Brilliant food only disadvantages of the restaurant is that you can hear the person 2 tables away speaking to his wife about how they are going to end their night, if you know what I mean, other than that the food is brilliant. Great place at lunch time as not too busy or noisy. Great efficient and friendly service from fabulous Bijo! My Partner and I decided to celebrate Valentine’s Day a couple of days early. This is our second visit and again we were not disappointed with great food and service. We ordered the Surf and Turf at £36pp. Quick service and food was great as expected if not a little overpriced for the portion size. Staff were helpful and polite. Hotel restaurant with nothing-special steak and lobster. The staff was slow to serve us, steak and lobster is usually good it was our first time going to this branch today and everything was horrible from the service all the way to the food . The food wasn’t as cooked as I asked for it to be, I sent it back and they came back and I suffered with the same problem. 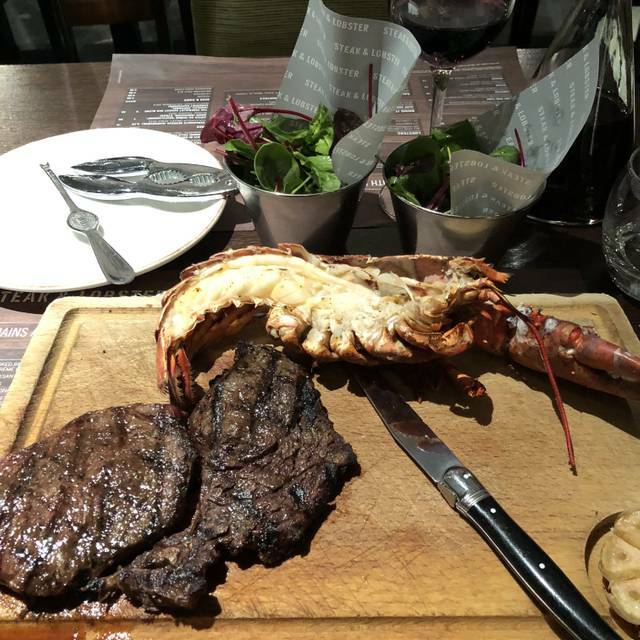 I usually love steak and lobster, however I won’t be showing up to the steak and lobster in Marble Arch again. Tables too small, very noisy but food was good could be better & slow service. Lovely food , served by lovely and attentive staff. 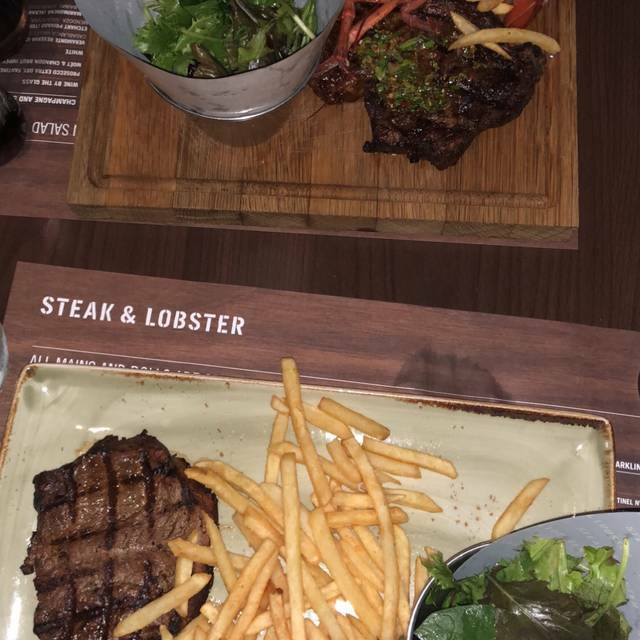 Steak was cooked to perfection & so was the lobster. Only criticism is we need a new sauce! Garlic butter is great but not flavourful enough. We need something saucy & a hint of spice maybe , like a shabang sauce! The food came out piping hot. The steak just melted in your mouth. The staff were very attentive. Will definitely be returning! Very good food but a lot of noise. Kids friendly and Nice service. It was an excellent experience. 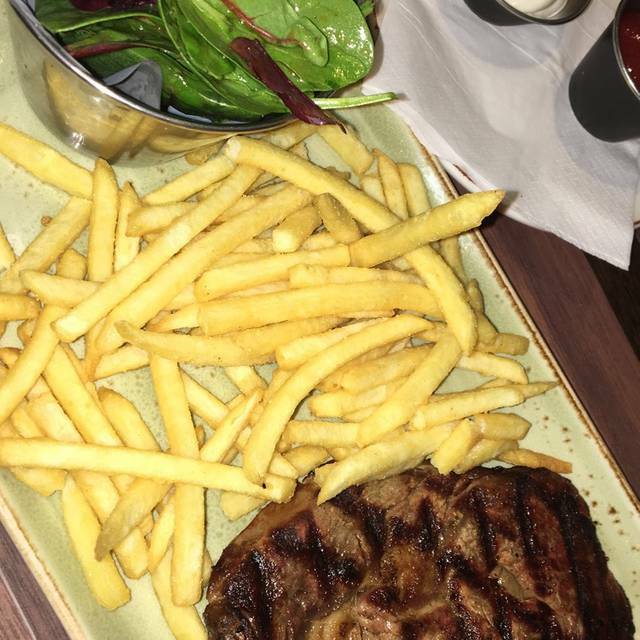 I am very pleased with the staff, atmosphere and the STEAK, which is definitely one of the best i have ever tasted. The crab is good, no as excellent as the steak, but the overall experience will make u enjoy ur time. THANK YOU! 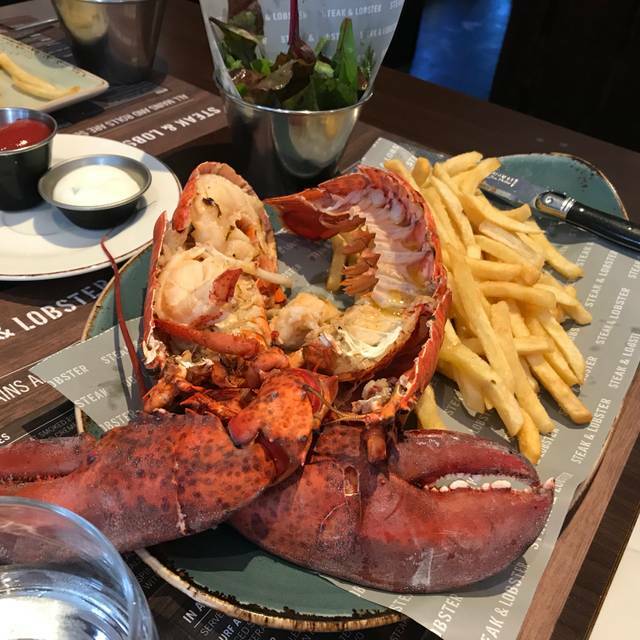 Having been to Burger and Lobster, a different chain which is great, we mistakenly booked this one thinking it was the same and were very disappointed. The "in a roll" options are very mean portions and everything is overpriced for what you get. Unlimited fries....big deal! Only a few tourists and us in the restaurant, says it all really, no atmosphere! The other chain wins hands down! Fantastic food, great service and lovely atmosphere. very pleasant experience, much improved over last year. We had the same server as we had last year and he was very pleasant, remembered us and went out of his way to provide excellent service. He did recall the issue we had last year and offered his regrets, he more than made up for the poor experience last year. Thankfully we had no dealings with the very unpleasant "manager" who is also still there. Excellent food although a bit on the pricey side. One very odd observation....there was a table of three young men seated in close proximity who vaped throughout the meal. Something I have never seen anywhere else, EVER. Most usually in an eating establishment when there is no smoking there is no vaping.... this however, seemed fine with the staff. Very odd. Christmas dinner. Expectations were high. The meal was expensive. Seriously disappointed. The “tacos” were like cream chipped beef on a Pringle. The Pringle or crackers tasted stale. The lobster was small and came in a half with next to no meat. The steak ordered was medium rare. It lacked a pink center. The staff seemed out of sync and the pre-order did not seem to matter. Expensive for the service and delivery misses. The wood boards were cracked and leaking juice off the table onto the floor. This made it a Blue Christmas dinner. Sad. Excellent dinner, food was so lovely, Atmosphere was great. Got a free birthday surprise. Only downfall is it took over 30 mins for us to get the bill, correct it as it was wrong, try two different card readers as they weren’t working and eventually had to pay in cash ( thank god i was prepared). However i would definitely come again. Thank you. We booked for our anniversary- the service was quick, smooth and very natural. Really pleased overall, and they brought out a special cake for our anniversary too!